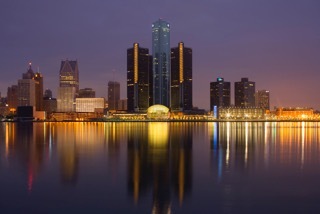 Experience a contemporary urban retreat at Detroit Marriott at the Renaissance Center. Located in the heart of Detroit, our hotel positions you on the famous RiverWalk and steps from the Cobo Center. Get around the city with ease via the People Mover stop, conveniently located in our Renaissance Center. Spanning 70 floors, our hotel rooms feature floor-to-ceiling windows with lovely city, river and Canadian views and thoughtful amenities. Enjoy all-day dining in our hotel restaurant or stop by Starbucks® for coffee and lighter fare. Break a sweat in our modern fitness center. Discover 100,000 square feet of indoor and outdoor venues, including our convention center and three ballrooms. Celebrate with friends in our Wintergarden, relax with complimentary Wi-Fi in our elegant lobby or sip cocktails on our outdoor patio overlooking the Detroit River. We are confident, whether you're here for business or leisure, you will find our superb service, downtown setting and premier amenities create the perfect stay. Click here to access online reservations. Reservations can be made via phone by calling (877) 901-6632. Guests must mention the group name, "Midwest Archives Conference" in order to receive the group rate. The hotel room block cut-off is Tuesday, March 12, 2019 at 4:00 PM, CDT.